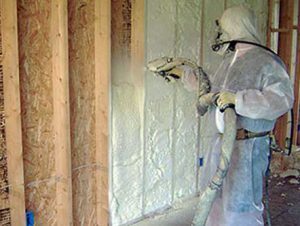 Spray Polyurethane Foam (SPF) insulation contractors may think that using proper safety and protective gear is only required during actual spraying. At Intech Equipment & Supply, we believe it is vital to protect all SPF workers from potential hazards any time they are in the spray rig, and when they are cleaning their foam insulation guns. In fact, cleaning foam insulation guns and related SPF equipment with solvents in the back of your spray rig can be potentially hazardous. The first level of protection should be adjusting controls, such as your exhaust hood, to properly vent the chemicals from the rig and protect yourself, or your team members, from exposure. Typically, standard spray suits and work gloves are not adequate protection from most solvents, so you should always use additional protection. We suggest that all workers wear a chemical-resistant apron, chemical-resistant gloves, safety glasses, and a face shield before entering your mobile spray rig. Furthermore, proper respirators are required by many manufacturers when handling various solvents. It is important to read the manufacturer’s Material Safety Data Sheet, or MSDS, and follow the recommendations for proper protection when using your spray foam gun and handling various chemicals. Additionally, be aware that some chemicals are reactive with others and can potentially produce gasses that are highly toxic. We suggest using them one at a time and not mixing chemicals as a regular best practice. Several critical safety measures and precautions must be followed by SPF insulation professionals, especially when it comes to using and maintaining foam insulation guns. The Spray Polyurethane Foam Alliance (SPFA) compiles a list of health and safety resources of interest to SPF contractors, with a page the organization regularly updates on their website. Check out the SPFA health & safety page here. Or, visit the Resource Center on the Intech Equipment & Supply website for more safety-related information.